Thirty years ago a group of Dutch guys settled down in California in order to serve the local flower industry with their expertise on energy shade curtain installation. Many years and projects later, the Total Energy Group has grown from a local service company to one of the most important suppliers of greenhouse technology, installation and supervision on the West Coast. 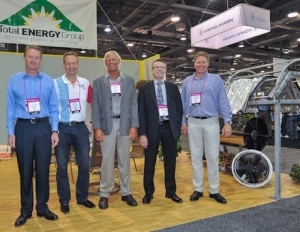 The Total Energy Group was founded when Peter Stuyt and Bert Neeft decided to move from Holland to California in order to serve growers in and around Carpinteria with their knowledge on greenhouse technology and installation. By then, the fresh cut flower industry in that area was thriving and a lot of local growers used to contact them for their energy, shade and blackout screen installations. With the local U.S. flower industry under pressure due to fiercer competition from Central and South America, the Total Energy Group started to take a look at new markets as well. “We began to play a major role as a wholesale supplier of Dutch technology to U.S. greenhouse builders. We add value to their products as we have a lot of in-house knowledge on the local market and its conditions. We know how to serve the U.S. greenhouse industry, and became a link between Holland and North America with dealerships and service activities for companies like Berg Hortimotive, Crone boilers, Vitotherm burners, Zantingh heating supplies, Holland Heater, Philips LEDs, Genap water storage, Priva automation and Mardenkro shading systems. This plan of action was also the catalyst for the Total Energy Group becoming the exclusive dealer of De Gier Drive Systems in 2012. For that fast growing industry, the Total Energy Group is the premier supplier on the market with a 100% black out system. Dennis van Alphen, Ruud Schenkels (De Gier Drives Holland), Bert Neeft, Peter Stuyt and Arthur Kroon of Total Energy Group. According to Van Alphen, the Total Energy Group has plenty of work to do for the coming years; they still have that large and older customer base in the (cut) flower and bedding plant industry, but in addition to this, protected cultivation of edibles is creating more work for them. Last year for example, the crew was very busy installing the heating systems at SunSelect in Tehachapi, California and welding the buffer boiler tank at Mastronardi in Coldwater, Michigan, to name just a few.